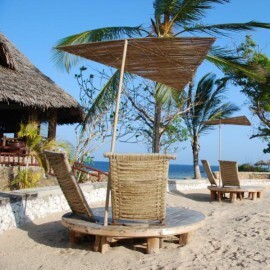 Che Shale is located north of Malindi Kenya, the only hotel located with a 5 km bay stretch thus offering an exclusive quiet and relaxing atmosphere. 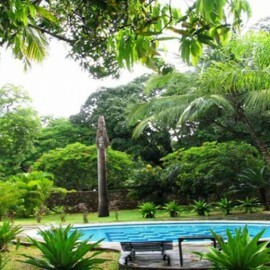 On the edge of a coral reef the hotel is surrounded by coconut trees and indigenous vegetation. Che Shale has 12 luxurious ensuite bandas built with renewable local material. They are furnished with exclusive hand woven furniture from local materials like mango wood, cedar wood and palm fiber they also individual verandas with daybeds and open showers. 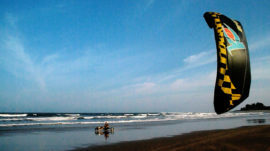 Guests can enjoy massages and the famous kite surfing.There is also the Kajama rooms which are bandas which are budget rooms for long stay guests or budget conscious guests. The bandas are built on stilts and surrounded by long leafy doum palms. The wash area and toilets are shared and are located behind the bandas. Both Che Shale and Kajama residents dine in the restaurant which serves both local and international cuisine like sea food, grilled meat, different pasta dishes, sea weed in batter among many others. Che Shale & Kajama has extensive water sports to include kite surfing, stand up paddle, surfing, scuba diving, snorkeling and deep sea fishing.